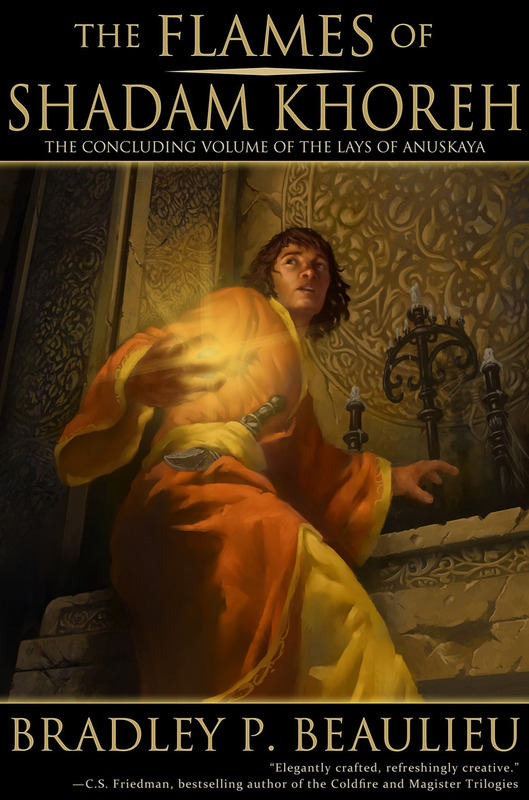 Bradley P. Beaulieu will soon release The Flames of Shadam Khoreh, final installement in The Lays of Anuskaya series. When he offered to write a guest blog to share his thoughts on what it's like to complete a trilogy, I was happy to oblige! And don't forget that you can download the first volume, the excellent The Winds of Khalakovo, for only 2.99$ here. And the second installment, The Straits of Galahesh, is now available for 4.99$ here. 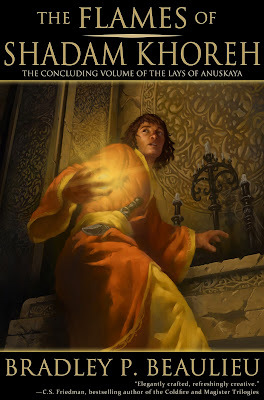 I've talked in the past about what it was like to write the first and second books in a trilogy, but I've been eager to write more on the subject since completing The Flames of Shadam Khoreh, the concluding volume in The Lays of Anuskaya trilogy. In fiction, we often talk about rising tension, about the expanding possibilities that are presented to the heroes after some inciting incident. The heroes often aren't aware of the full import of the events that present themselves at the beginning of the story. It's only later, as they try to resolve the problems in progressively more difficult ways, that they understand the full gravity of the situation. Even in something like The Lord of the Rings, where we learn early on that Bilbo's ring is the One Ring, we know the situation is dire, certainly, but we don't fully understand what's at stake and what Frodo will need to do by the end. It's only until well into the third book that we see how expansive the war effort is and how dire life under Sauron would be. Early on, we are worried, certainly, but Frodo still has some hope that this burden won't be his to bear for too long. It's only at the council in Rivendell that he joins the quest in earnest, and only at Amon Hen, after Boromir's death and his decision to take the ring on his own to Mount Doom, that he commits himself fully to the task at hand. I liken the "shape" of a story to an American football. At the beginning of the tale, some event (the inciting incident) sets things off, and as the story progresses, the possibilities, the danger, the stakes, all become more real, more complicated, and more serious. The story widens like a cone with seemingly endless routes to resolution. Around the middle of the novel (and the middle of this conceptual shape) the ending starts to resolve in our mind. Possible outcomes are pruned as we head ever closer to the end. The shape, in other words, is molding inward, narrowing further and further until there is only one possible outcome left, one last desperate attempt that must be made to overcome the odds and set things right. In a standalone novel, the threads of possibility tend to resolve nicely. In a trilogy, however, some of those threads are left dangling. The immediate concern has been resolved, but there are more threats on the horizon. If we take this "football shape" paradigm to the series as a whole (whether it's a trilogy or a longer series), we have a widening of threads on a larger scale. More characters, more stories, more dangers come into play. And so, it's not merely a single novel that takes on this shape of expansion and contraction, but also the overall tale. In a Book 1, the early story threads are introduced. In the middle books, those threads widen and complicate. And in the closing novel, they all come together to produce not only a climax for that one novel, but for the overarching tale. Consider this for a moment as it applies to longer series—those longer than a mere trilogy. I'm not talking about open-ended series like Jim Butcher's Dresden Files, which is more episodic in nature. I'm talking about A Song of Ice and Fire, The Wheel of Time, Malazan Book of the Fallen, the nascent Stormlight Archive. As rewarding as those long-running stories are for fans, they're a nightmare for the author to keep track of, and it's precisely because of these expanding plot threads, which—if you're not careful—can grow like ivy. They can mire you down in untold numbers of incidental stories that don't add to the full effect of the larger tale. Or worse, they can take you to places you didn't wish to go, plunging an otherwise fine series into a swamp of aimless agendas and listless plots. I would contend that this skill set—the growing of a story without letting it get out of hand—is one of the reasons writers hit their "sophomore slump." They were skilled enough to write that first novel, but taking it wider—expanding on the story in a manageable way without treading the same ground, exposing new parts of your world, adding nuances to the fantastical elements, introducing new characters with their own hopes and fears and goals—well, that's another thing entirely. I found this to be true in The Straits of Galahesh. It was a difficult walk down the tightrope for me, trying to keep the story moving naturally in the direction The Winds of Khalakovo had set without it feeling like I was writing the same novel. I needed to move toward the grand finale without taking it too close. I had to wrap up some of the dangling threads from Winds, while creating new ones for Straits and leave some dangling for the third book to pick up and run with. By the time I got down to writing The Flames of Shadam Khoreh, I was already beyond the "halfway point" of the trilogy. I'd known for years where the story was going to end up. I didn't know it's exact incarnation—for me that comes in the writing—but I knew the neighborhood I'd be in when the story finally wrapped up. And so a lot of things were working in my favor: I'd put in a ton of work on the world (on the characters, on the plot, on the cultures and politics, on the magic and its consequences). And I knew where things were headed. So while the third book didn't exactly write itself, I found it to go much more smoothly than Books 1 and 2. I still had to expand the story from the beginning of the novel, of course, but there were built-in guideposts along the way to help steer me toward the big climax. And about that. The climax. I have to say that as a reader, they can be rewarding, but as a writer, when you've finally reached that last page of the first draft, when you've gone through the book a few more times and know that it's wrapped up, and that it's wrapped up well, that's an amazing feeling. I've come leagues and leagues from where I was when these books were first envisioned. I've grown as a person and as a writer. The characters have become more real to me. Their stories mattered to me in ways they didn't in the beginning. So when I finally finished the climax of the tale, when I finally put a bow on the story via the epilogue, I was pleased in a way that I've not experienced before. The story had come full circle for me, and yet just like me, Nikandr and Atiana, Nasim and Soroush, were in very different places from where they'd begun. The funny thing is, it's because the beginning and the middle were so difficult that the end was so rewarding. The journey is the reward, yes? This is a tale that I'm very pleased with, and very pleased to share with you. I hope you enjoy reading it as much as I've enjoyed writing it. Great guest blog. Love the whole talk on series structure, but I found your American football analogy particularly inspiring. Pat I want more of these! Thanks much, JC! I was glad to share. Can't wait to read this one. Such a unique setting for these books, really refreshing to read a series that doesn't follow the same old tropes as other fantasy series! Thanks very much, CJohnson. That's certainly part of the reason I wrote them, so it's good to see people enjoying that aspect of it. I've really come to love the setting myself.